It’s very hard to make generalizations. An article might say, “The French love their cheese,” and, of course, there will be someone out there who will say, “I have a French friend and they don’t like cheese.” Or “Americans love cinnamon,” which is partially true, although I’m sure there is at least one or two of you out there that can’t abide it. Generally speaking (at least according to the lines at my cheese shop), the French do love cheese. And judging from how liberally cinnamon is used in American recipes, we do like our cinnamon. Another generalization is that the French don’t really celebrate Halloween. Certainly not to the extent that we do in the United States. I posted something about that elsewhere, and it was pointed out that there are places where Halloween items do make an appearance in France (some French bakers and pastry chefs like to play around and make ghoul-themed treats for the American holiday), but generally speaking, Halloween is a holiday that isn’t widely celebrated, or given the attention, that it gets in the United States. Romain, who is so French that if you look up “French” in the dictionary, you’ll find a picture of him next to the definition, is unusually open to new foods and flavors. But I knew he wouldn’t love this pumpkin jam if I added spoonfuls of spices to it. When I was making it, I unscrewed the lid off my cinnamon jar and I took a whiff, then decided I didn’t want to add it either. So you can take me off the list of clichés about Americans who add cinnamon to everything. Don’t get me wrong, I love cinnamon. (And reserve the right to add it to anything in the future.) But my instincts to go with using a vanilla bean turned out to be spot-on. Along with a dose of lemon and orange juice for balance, the slightly floral flavor of the bean took the accent off the vegetal flavor from the pumpkin, and turned it back into a fruit, which technically pumpkin is. The pumpkin jam turned out to be a hit. It was especially good spread on levain (sourdough) bread, but I could imagine it making a nice filling for a jam tart around the holidays, or even alongside a cheese platter. Generally speaking, the French don’t serve jam with cheese, but for this, you could make an exception. 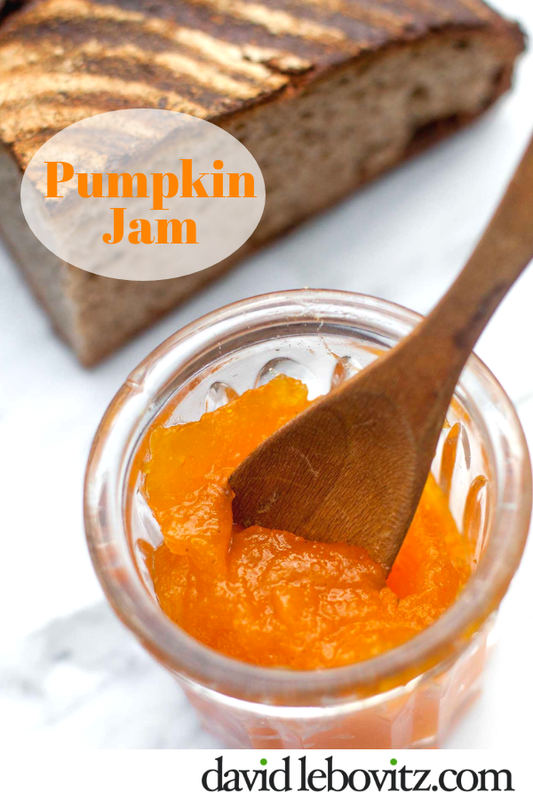 Make sure you use a roasting or sugar pumpkin for this jam. 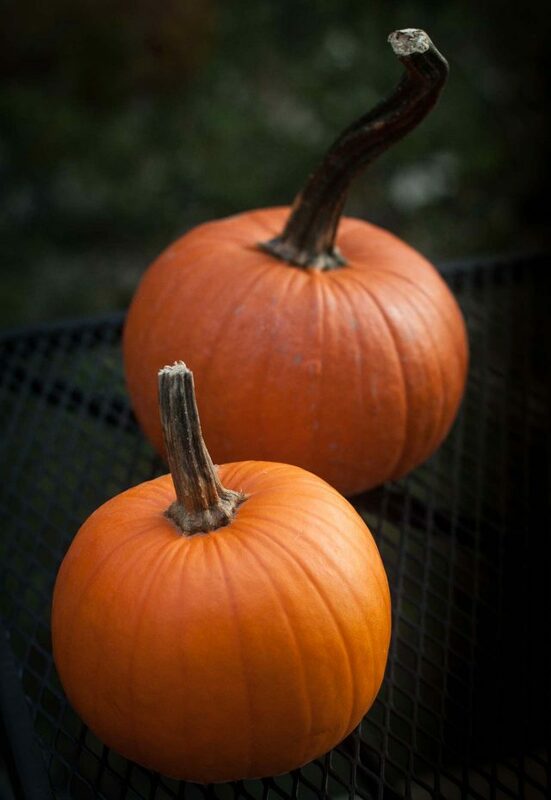 Other types of pumpkins, such as those meant for carving, have a higher water content and will not cook up the same. (Steaming the pumpkin is an idea inspired by the Soframiz cookbook.) This recipe makes one large jar, or two smaller ones. You can scale up the recipe to make more if you wish.You don't need a thermometer to make this jam; you can tell visually when it's done. And since it makes a small batch, you'll likely eat it quickly. But it will keep for at least a month or so in the refrigerator. I give some tips after the recipe in case you're interested in canning, as well as a few other notes on the recipe.If you do use a thermometer, jams often jell at around 220ºF (104ºC) however this one was ready when the thermometer reached 200ºF (93ºC). Still, for this jam, it's easy to see when it's ready as it'll visibly thicken, so a thermometer isn't necessary. 1. 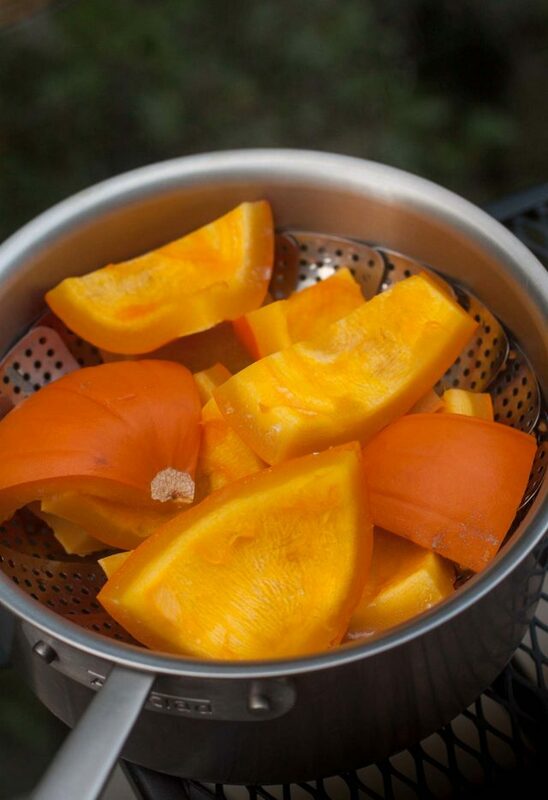 Place the pumpkin pieces in a steamer basket in a pot. Add water to the pot so it reaches to the bottom of the steamer basket and steam the pumpkin pieces until completely cooked through; a paring knife will pierce the flesh easily and it will take about 30 minutes. During the steaming, add more water to the pot if necessary. 2. When the pumpkin is cool enough to handle, scrape the flesh from the skin and puree it in a food processor or immersion blender, or pass it through a food mill or potato ricer. 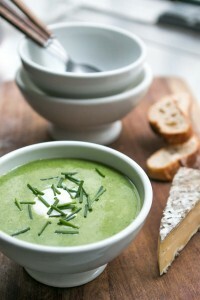 You should have about 2 cups (535g) of puree. 3. Put the puree in a heavy-duty saucepan along with the sugar, orange and lemon juice, and salt. Scrape the seeds from the vanilla bean with a small knife and add them to the pot, along with the bean. 4. Cook over medium heat, stirring frequently, until the sugar dissolves.Continue cooking the pumpkin mixture, stirring constantly to prevent the puree from burning. Because the puree is thick, it'll tend to splatter. You may wish to wear an oven mitt while stirring. 5. When the jam mixture visibly thickens and it holds its shape in a jelly-like mound when you heap it up onto itself, it's done. It will take about ten minutes.Scrape the mixture into a clean jar. The jam is best served at room temperature. It can be refrigerated for at least one month. The two questions I get frequently when sharing jam recipes are, 1) Can I reduce the sugar? and, 2) Can I can this? Because I get asked these questions often, I thought I’d answer them here. Sugar isn’t just a sweetener but is a preservative. That’s why jams last so long. The standard proportion of sugar in a jam is 1 part sugar to 1 part fruit. So two cups (500ml) of fruit puree would call for 2 cups (400g) of sugar, although some go by weight and use equal amounts of the two. I don’t like things excessively sweet, especially when using fruit, so I try to moderate the sugar in recipes when developing them. However when making jams and jellies, the sugar isn’t just for preservation but aids in jelling as well. A certain amount of sugar is necessary to ensure that it will set. Although I don’t use it much, some jam makers like to add a natural jelling agent, like pectin. 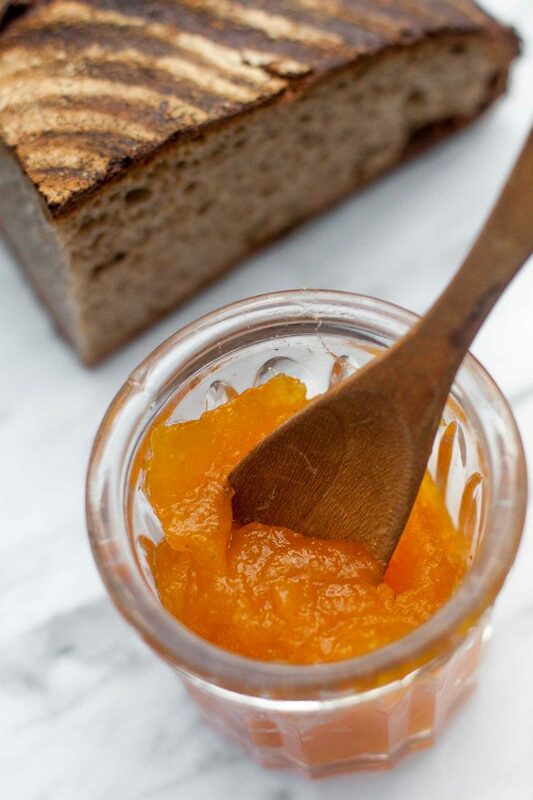 It comes in powdered or in liquid form, or you can make your own pectin. You can find more information about using it here or follow the instructions on the package. Note that using pectin doesn’t automatically mean that you can reduce the sugar in a recipe. 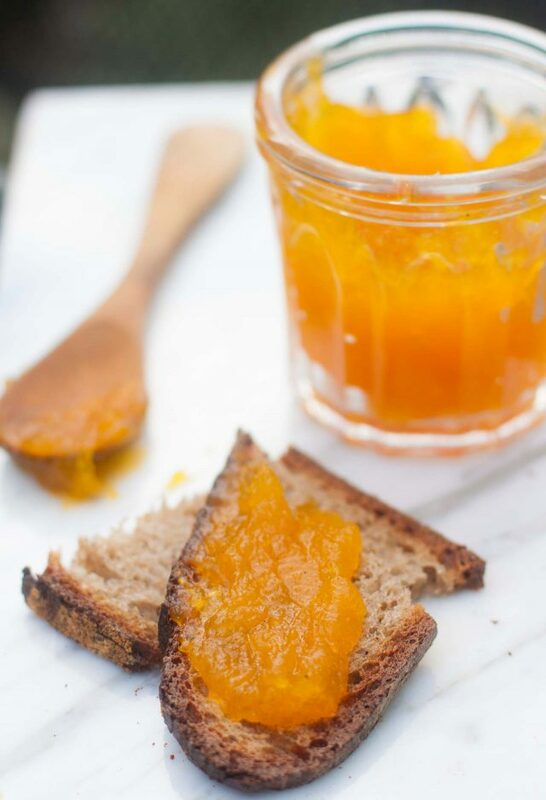 It’s best to use a recipe that is specifically formulated for pectin and/or low-sugar cooking. Another question I get about making jams and jellies is about preserving them or canning. I’ve been making jam for over thirty years and to be honest, I don’t preserve them for long conservation. I just stick them in the refrigerator and eat them within a few months, and have never had a problem. I do sometimes use the inversion method which is popular in Europe, where you fill a jar, screw on the lid, and turn it upside down, which creates a seal, although that method has recently come under scrutiny. If you wish to process a jam or preserve for long conservation, there are complete guidelines to canning almost every type of jam, jelly and chutney at this website. Not sure about in the U.S., but in France they sell sugar with pectin already in it. Re cinnamon, Belgian husband HATES it (but likes Speculoos, so go figure). My baby brother, though used to go crazy with cinnamon-sugar on toast. That stressed our mom: cinnamon was expensive and the budget was very tight. To get my brother to cut back, I spun a tale about “cinnamon disease,” assuring him that a little was fine, but that he needed to stop with the big quantities. So months later, at Christmas, somebody served a dessert full of cinnamon, and my brother, mindful of how much he had already ingested that day, backed off, saying he didn’t want to get “cinnamon disease.” Boy, did I get in trouble! Today, of course, he eats cinnamon to his heart’s content. I’ve not seen that kind of sugar sold in the U.S., but yes, they do have it in France. The recipes the company gives for it calls for the same amount of sugar (1 kilo fruit: 1 kilo sugar). I do add lemon juice to most jams, which adds some pectin, but for low pectin fruits, some people do use pectin. Americans love pumpkin in pie, but until recently it was rare to find in savory dishes. That has really changed in the past 2-3 years. PS: I just love your blog, especially this kind of contemplation about culture. Actually, lemon juice doesn’t contribute any pectin, but it helps any pectin already there to gel better. Though I will still use a lemon off my tree rather than buy the bottled stuff as they suggest! One American here that does not share the affinity for cinnamon – especially when combined with apples. Leave the apples alone ( butter, sugar and a little vanilla are fine – but leave out the cinnamon people). Then again, I think the whole “pumpkin-spice” everything craze here is horrendous,too. Mind you I do love other herbs and spices, and even cinnamon in dishes like Egourdouce just as long as everything doesn’t taste like cinnamon. Love your blog , David. Aside from recipes , I love your places of interest, and try to visit them on my now too infrequent trips to France. Would this be a butter, like apple butter? If not, what would you say is the difference between pumpkin jam and pumpkin butter? And I love the idea of using vanilla! I hate to ask such a plebeian question but I’d love to try this and only have good quality vanilla extract, no beans. How much extract do you think would work in this recipe or is the bean absolutely necessary for this to work? Thanks! Tomatojane: Vanilla extract is a somewhat different flavor than the bean, which is more woodsy and floral than extract. Because they all vary by strength, there isn’t an exact equivalent that works across the board, but I would try 1/2 teaspoon of extract, then add more to taste (once it’s cool, of course), if desired. chill: Am not sure what the definition of a butter is, versus jam. Perhaps jam is less-cooked? I’ve not make it but the recipes I’ve seen for apple butter have you cooking it for a much longer time. And such a great color! My understanding is that pumpkin butter is highly spiced & really reduced……so a quite different product. Spiced meaning cinnamon, perhaps ginger etc. Certainly apple butter is. The pumpkin butter I’ve had is like apple butter, but rather pumpkin. Decades ago I introduced my mom in Germany to pumpkin seeds and from then on she grew lots of pumpkins in her garden. She never baked with it but she made soups and sweet and sour pickled pumpkin. Gerlinde, Sweet and Sour Pickled Pumpkin? Sounds interesting! Do you have a recipe you can share? I am making this for the weekend. I also make a chili pepper jam to eat with cheese and I think this would be a perfect to go along side it. And who doesn’t love that gorgeous color. Many thanks. This looks perfect. Thanks, David. I’ll be making it this season. Would it ruin the balance if I added just a pinch of cinnamon? By the way, I was in France, near Carcassonne, on Halloween back in 2001, and was surprised to see children in costume Trick-or-Treating. My host said it was still unusual to see, but the tradition was picking up…slowly. Very slowly. I make something very similar using butternut squash marked with flecks of vanilla jam. We serve it with cheese and nuts. Yours look equally w wonderful. In making preserves, jams, and jellies, the reason for bring the temperature to 222° F. (106 C.) is that that is the temperature where the concentration of sugar to water is such that the pectin, either natural or added, will set up. I am not sure that this is pertinent to this recipe because, if it is “jamming” at 200° (F), which is lower than the boililng point of plain water, there is clearly something else at work in the thickening process—I am thinking that pumpkin may be high in starch and that that is what is causing it to thicken, rather than pectin. Generally speaking, that´s another expectedly cool recipe from DL: And also generally speaking, vanilla bean is always a good idea. Ok, I’ll bite. Anyone have thoughts on using canned pumpkin. I know it’s a bit blasphemous.. but figured I’d ask since it’s what is on every Americans mind. I haven’t tried it with canned puree but assumed the question would come up so I gave the volume equivalent for the pumpkin puree in case anyone wanted to try it. (I think the canned puree may be darker than fresh pumpkin, which would mean the jam would have a different color than mine, shown in the post.) If you do try it, please let us know how it turns out. Sorry Romain but I like my jam with Vanilla bean ( nothing beat a real bean or pod as you want to name it), orange ( zest and juice) but also a pinch of nutmeg, and cinnamon. 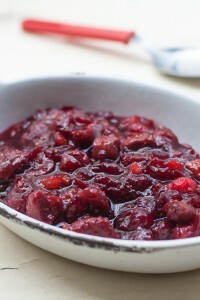 Serve it with the bird next to the cranberry and Grand Marnier sauce. Getting in the mood for Thanksgiving… Had a great Pumpkin cookie this PM at Jean Hwang Carrant on rue d’Aboukir..; Yummmy !! Your jam looks so gloriously silky. My problem with pumpkins is string. I can never make anything without fibrous strings showing up, although I enjoy pumpkins enough that I deal with it. Perhaps if you use a ricer or food mill it will strain out the strings. Maybe a stupid question, but what is a cooking pumpkin? They’re usually small and orange–look for Sugar Pie pumpkins, which most supermarkets carry this time of year. Unlike carving pumpkins, which are hybridized to have very little flesh, their interiors are dense, like any other squash. I do love all things pumpkin, and I’ll be making this asap. As for other jam, I find a ration of 1 cup fruit: 3/4 cup sugar works well for most fruit jams–for fruit with a decent amount of pectin to begin with. If you are looking to reduce sugar slightly and still get your jam to gel and last a long time, those amounts work for me. So you eat jam on bread without any butter? Interesting…would never have thought to try that, but I’ll give it a go! It is only the “Baby boomer” generation and its descendants who have had any idea of eating butter AND jam on the same slice of bread; before us, it was very definitely either butter or jam, but not both. My parents, American Swedes from the roaring 20’s always had butter and jam. Generally they’d have it after a meal or with coffee. Perhaps it’s a cultural thing, rather then generational? David, would Potiron be a ‘cooking’ pumpkin? Also, it so much looked like a quinze purée that I decided one could use it with cheese & a crusty, ‘heavy’ bread such as a pain de seigle? What do you think? Beautiful photos – and I (as a Swiss) love cinnamon and hate peanut (butter)…. LOVE your musings about local and international habits. But nobody so far could explain to me why oh why the world and its grandmother is ‘celebrating’ Halloween. I feel usually harassées! Call of distress – I can no longer opt for getting the comments on your posts to my email? Have you changed provider? Or (and I hope to God that’s not the case) has the recent update on Hero Husband’s iPad ‘deleted’ that possibility? Kiki: Not sure why that’s not showing up anymore. I can ask my web developer about that. Yes, a potimarron is a cooking pumpkin but in Switzerland, I know you have potirons as well, which are also cooking pumpkins. There are also citrouilles which are explained, and compared, at that link. UPDATE: When we added the print option, somehow that’s not compatible with the “Notify me of comments” thing that I had. So it is either one or the other. Sorry! Chuck: I started with a 2-pound pumpkin and that’s how much puree mine yielded. Other pumpkins may yield more or less, so I included that measurement as I knew people would want to know. Vilde: Check out the link at the end of the post, which lists some common “cooking” pumpkins. Cecilia: Yup – you could certainly add some cinnamon or any other spice you wish. McKenzie: For this I used an immersion blender but you might have luck with a food mill, since you can get purees very fine with one of those. Jake: Good theory. You’re likely right that the starch is doing that. I’d say the American pumpkin used to carve Jack O’lanterns is nice for decor but not so good for cooking as Potiron ( Potimarron, Butternut and more of that kind) are too good to be carved. Also David same issue here. Cannot get the comments to your post as before. is it possible to send a photo of nice display of cooking pumpkin shot at Terroir d’Avenir a few days ago ? I do appreciate that you need to cover yourself in your recipes but, truly and honestly, there is absolutely no need to refrigerate jam, as long as you have potted it up in sterilised jars and sealed it with a wax disc and cellophane cover. It will keep for several years, although it’s nicest fairly fresh. Your pumpkin jam looks good, but I wonder how much flavour it has? I tried making fig jam one year, and it was sweet nothing, and I’m afraid pumpkin jam might be the same….. as marrow and ginger invariably is, even with the ginger! I’ve made jam for decades, and being a Brit, don’t do this fancy “European” method of putting the jam in the jar, put lid on and invert to make a seal.. [A dig at the Brexitiers]. I’m reusing commercially available jam jars – purchased with jam in – here. Annabel’s method was what my parents used to do, which was when, in the UK, shop jam jars had push on seal metal tops which generally were damaged in opening. Why jam jars were like this when others – Marmite, Ketchup – had screw threads moulded in I don’t know. For some reason, I seem to think Lemon Curd was the last type of preserve that had the push on lid rather than screw top, but I’m sure wiser people will correct me on that. I pour the hot jam into pre-heated jars (slowly brought to temperature in the oven), then screw in the metal lids on and let them cool, Any whose lids don’t depress (due to no vacuum inside) use immediately. Those that pass the test are fine for years, but to be honest not many were kept for anyhing like that time before they were consumed. In village fete preserve competitions, you lost points if you used a screw top jar, even if traditionally sealed. Not sure if that still holds true, as original jam jars for push on lids are now as rare as hen’s teeth (the metal lids even more so). If I ever see any, I go in and stock up before the hoarders get there,.. and I’m not living in a village. I’ve also used Kilner aka canning/Mason jars (also Weck and Parfait) with equal success. I note that “refirigerate after opening” is a common refrain on preserve labels in the UK these days. Never used to see that, nor does it appear to matter, although I’m not trying to keep open jars for years, they’re emptied in much shorter times. Too much sugar – or jam boiled down too far – will cause the sugar to crystallise out and it’s like having the occasional needle in your mouth when eating. Apples are high in pectin – I think they are used to make liquid pectin, or can be added to fruit naturally low in pectin for “natural” setting jams. I also pour hot jam, marmalade or chutney into hot jars and immediately put the lid on. It’s very satisfying hearing the jars pop as they seal! A lot of sites say pumpkin isn’t safe to can because there isn’t enough acid (obviously there is commercial canning). I know this calls for a small amount of citrus juice — does anyone know if that’s enough to create a safe pH level? Could I ask what type of vanilla bean you used (Madagascar, Tahitian, Mexican)? Usually, I find Tahitian vanilla so floral that it almost tastes artificial to me, but also thinking it might go nicely with a sweet pumpkin jam. Merci from Boston! I used a Mexican vanilla bean here. I usually use only those or Madagascar beans. 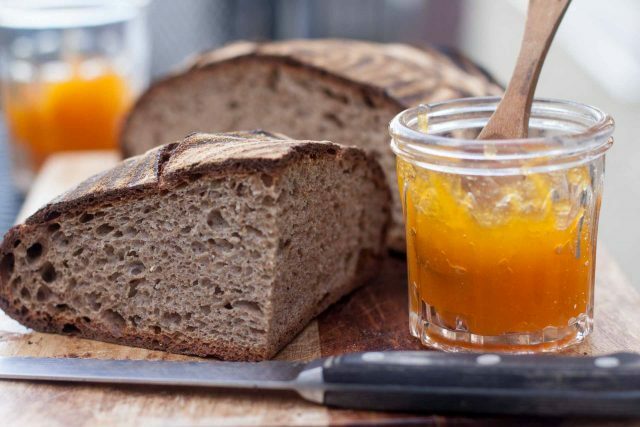 Our small ‘dorf’ here in Germany holds a pumpkin growing competition every year and in addition to pumpkin soup and pumpkin bread (nothing like American pumpkin bread – more like a white bread with the addition of a bit of pumpkin puree), we always make a big batch of pumpkin jam to sell. The recipe is very similar to yours, minus vanilla, plus fresh, finely chopped ginger – it is delicious!! Years ago while on vacation and at a fair I came across sweet potato preserve. It was fabulous, but I had no contact info from where I purchased it. I have searched recipes but never found anything I thought would be close. This actually looks and seems like it would be the best fit! Thank you. I will try it both as pumpkin and then give sweet potato a chance…ps I truely love your recipes! Genius! Love pumpkin and this is spot on! This is certainly a new one for me. I have never heard of a pumpkin jam, so that means I will be trying it out. 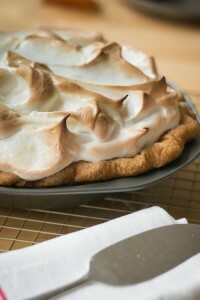 David, i made this today with the exact recipe–and then made the jam tart–wonderful!!! Thank you! Follow up comment. I made this jam and it was delicious. I served it with cheeses (gorgonzola dolce, feta, brillat-savarin) paired with my favorite pepper jelly for aperos and my guests absolutely loved it. I made a few jars up for guests to take with them, it was a perfect Halloween treat. Many thanks. David, by cooking instead of steaming pumpkin would result in less flavour? Is this the reason for you recommending steaming here? Just finished a batch and it’s delicious. Easy, too. I can see how this could be done with other, more available squash or sweet potato at other times of the year. One question. Remove the bean when done or leave it in to leach more flavor? some compared my pumpkin chocolate swirl bread to pain d’épices. Maybe I should go easy on the spices. I do love spices though. Christine: Yes, pumpkin is low acid and is not recommended for canning. Thanks for the link, which I had included at the end of the post for people to read more about. Bob: I leave it in, but it can be removed if you wish. Tony: Great – glad you liked it in the tart! Sorry, by “cooking” I meant boiling in water instead of steaming. Just because the previous one would be easier, somewhat. My husband loved it, too! Especially a big dollop on yogurt….. Lived in America for 73 years and bread and jam is just that….bread and jam…where does the butter come in? 50 years ago, people used to put a thin layer of butter on sandwiches, to take to work or school, so the sandwich content would not soak through the bread, ie., tuna, ham, chicken salad…however, that has long gone. If I want bread and butter that is what I will have not butter AND jam too! 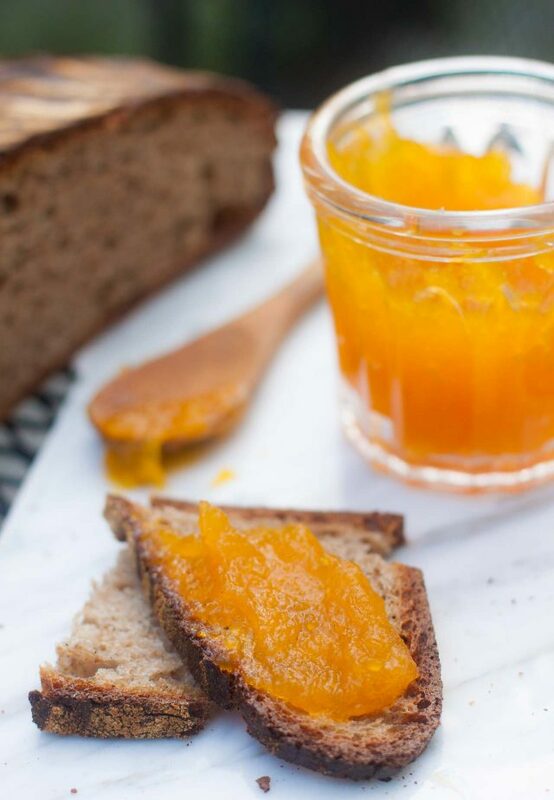 As you say, ‘Generally speaking, the French don’t serve jam with cheese’, but Portuguese do and in fact, pumkin jam with cheese is a very traditional portuguese appetizer. With cinnamon, or nuts, orange juice or not. Pumpkin jam is a must. And of course, if you have a good bread to go with it, even better. Your version sounds as good as well. David, thanks for the great recipe. Do you think it would work with the potimarron/red kuri squash you see a lot of around this time? Or do you think this is best reserved for soup? The stunning color alone drew me to trying this recipe! I used small pumpkins labeled “sugar” from my organic market. The jam jelled up quite nicely and the taste is subtle and lovely, but the texture is somehow a bit gritty. Is there some obvious place I might have gone wrong? Thanks for this exceptional website. I am inspired by you every week! Thanks! Pumpkins can really vary, so it’s hard to say. Some people say their squash or pumpkins are stringy when pureed. My advice if that happens is the pass it through a potato ricer or food mill, if you have one. People like those “turbo” blenders, and say they do a good job, too. If you don’t have any of those devices, you and press it through a mess strainer that’s not too fine with a flexible spatula, to make it smoother. Thanks for the potato ricer suggestion. That, plus taking the jam off the heat a bit sooner, did the trick. By the way, in a third batch (the second having been blatantly stolen by a neighbor), I experimented by adding the zest of the orange and lemon during the cooking, plus some finely shredded candied ginger and a couple of teaspoons of orange blossom water after taking the jam off the heat. Not too bad! Thanks again for your suggestion. Really enjoyed this recipe, as always your recipes are winners. I added the pumpkin jam to a grilled cheese sandwich, slathering on more with every bit. Simply Delicious! A word of caution, though – It is not safe to can pumpkin jam for shelf storage. You can pressure can pumpkin pieces, but the consistency of pumpkin jam (or pumpkin butter) is so viscous, that it can’t be guaranteed that the appropriate heat necessary to kill pathogens will penetrate all the way through, no matter what method is used. The USDA cautions against this, strenuously. Made as a refrigerator spread, it’s just fine, but please don’t try to can it. David, can I use Libby canned pumpkin? The recipe would be wonderful to make and put in my Christmas basket for friends. This jam reminds me of the jams that you can find in Nouvelle Caledonia. When its in season, they have loads of pumpkin there and sometimes not much else. I once stayed in a gîte that served 7 different kinds of pumpkin jam for breakfast. I made this jam today, using a potimarron and an overly ripe kaki fruit. The kaki added a fruitiness that I really love. Thanks for inspiring something tropical for these grey French winter days! I made a double batch of this for Thanksgiving gifts and woah vanilla. I don’t know if I just got a really strong bean, but the vanilla is almost overpowering. Thankfully I love the stuff so no big deal, and also the pumpkin flavor itself is deliciously concentrated. I was a little nervous the large volume wouldn’t jam up, but it just took longer, about half an hour. Yum! On pumpkin jam, I have never made that, and refer to others who know better about preserving/canning such a preserve. This came out wonderfully, and let me clean last year’s pumpkin out of the freezer to make room for this year’s. I’ll probably make a triple batch and call Christmas gifts done. The U. of Missouri extension webpage has the best online advice about canning processing times, for what it’s worth.